amk: Heat Things Up in the Hammock with a Heated Hammock..
Heat Things Up in the Hammock with a Heated Hammock..
There’s few things more relaxing than sitting in a hammock. But sometimes the great outdoors can get a little cold, especially if you’re not generating heat in the hammock the romantic way (wink, wink). 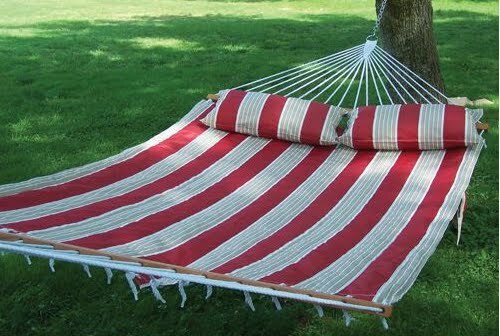 So now there’s the Heated Hammock Heat Things Up in the Hammock with a Heated Hammock, the only hammock with four heating elements woven into it’s surface guaranteed to keep you toasty while you relax. These four heaters generate up to 122º F of radiant heat to gently warm you from the shoulders to the lower back. There are three warmth levels you can select via the pair of wired remotes. The rechargeable batteries (AC adapter included) will power the heated hammock for up to four hours. 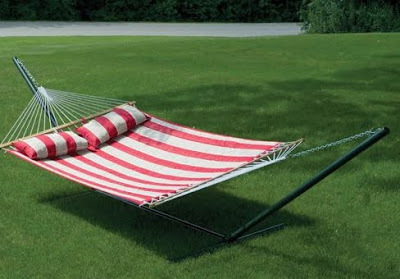 The hammock can hold up to 450 lbs and comes with two removable pillows. Great for those chilly summer nights or extending hammock season well into the Fall. $299.95 from Hammacher.